The air is thin and I could hear my ragged breathing. I wiped off the sweat that kept forming on my forehead and the top of my lips. The man ahead of me served as a beacon, holding a flashlight and stopping every so often to check how I was getting on. The ceiling is so low I had to walk in a bear crawl. Now imagine crawling in such a constricted environment for many days without enough food. 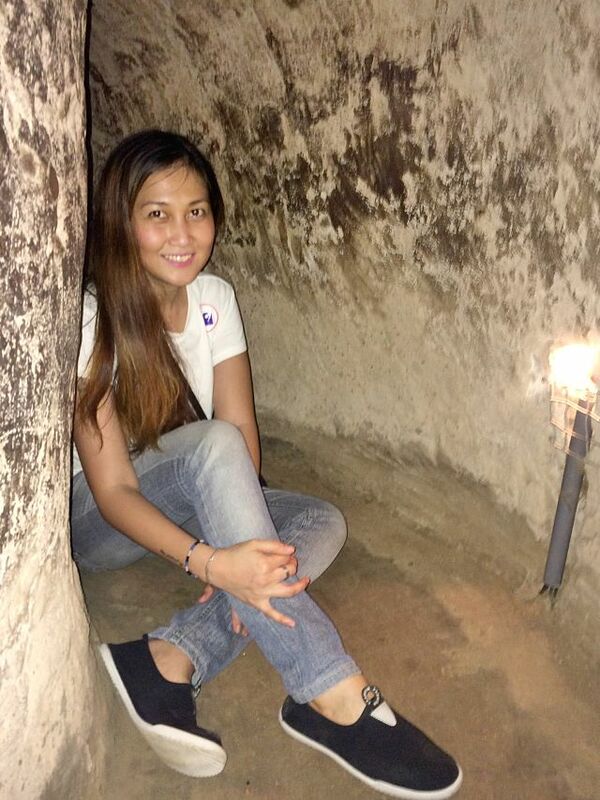 This is how the Viet Congs lived inside the Cu Chi Tunnel, a military base and now one of the most popular tourist destinations in Ho Chi Minh City. When my accidental travel companion, Bing, mentioned that she’s taking the Cu Chi Tunnel tour, I immediately tagged along. The entrance fee is only VND 90,000 or about PHP 190 – USD 4). 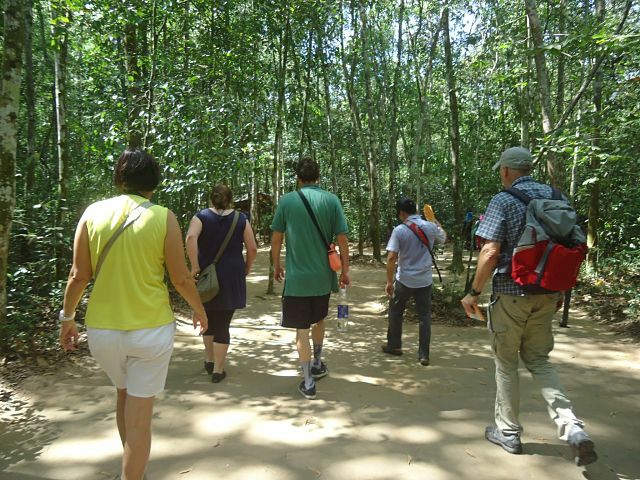 In our case, we availed of the Cu Chi Tunnel excursion of Happy Tour for VND 495,000 (PHP 1,000 -USD 24). 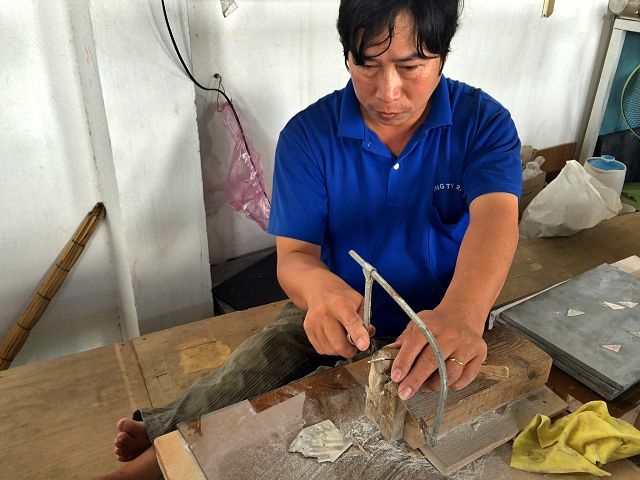 The package includes van transportation and a side trip to the Handicapped Handicrafts factory. And so we started calling him Andy; a happy-go-lucky tour guide who seems to be in his late 40s or early 50s. He shared that he used to work in a cruise ship where he was able to work and become friends with many Filipinos. His English name is given to him by these Filipinos because just like me, they struggled with the correct delivery of his name. Andy knows many things about Vietnam history, which for the most part I missed because I had trouble trying to understand him through his thick Vietnamese accent. In fact, when he mentioned about Agent Orange I thought he was referring to a person. It wasn’t until we reached Handicapped Handicrafts that I found out Agent Orange is a chemical; an herbicidal warfare program launched by the US military during the Vietnam War. Agent Orange’s effects are so harmful it not only destroyed food crops but also caused health afflictions and physical disabilities to the citizens. 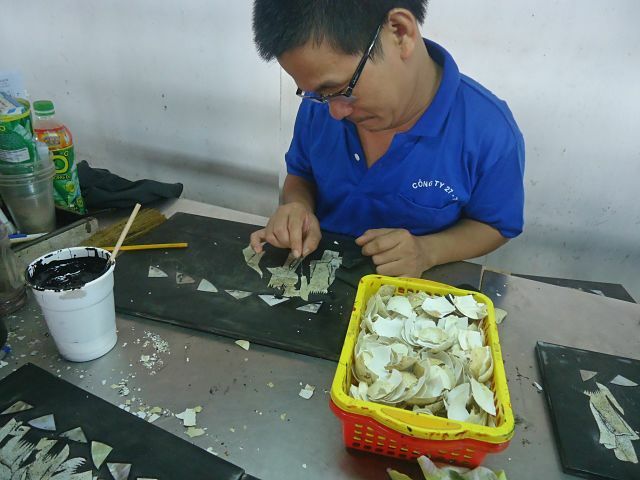 And some of these people are working in the Handicapped Handicrafts making lacquered paintings. At first glance, they looked just like any regular people, a closer inspection reveals that they have physical deformities or disabilities; some have enlarged fingers, some cannot walk, some have misshapen toes, and some have legs that are so bent they seemed to have no bones. But instead of feeling sorry, I watched them with admiration. These people did not let their physical disabilities get in the way of living and for that, they deserve my utmost respect. At the end of the small factory is a shop where you can see or buy their products and they are oh so beautiful! 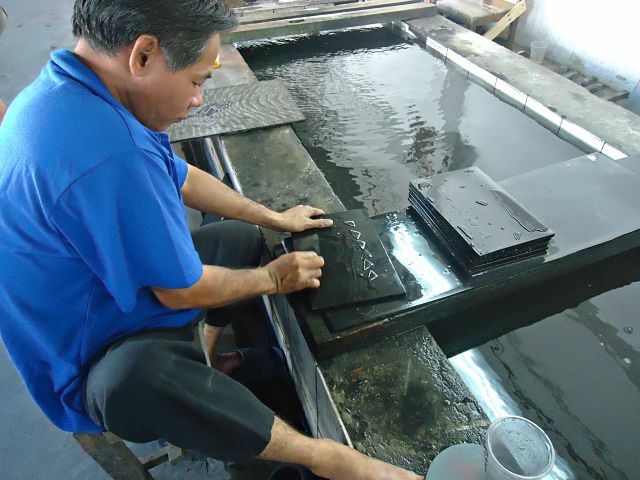 Given how tedious the process is, the lacquered paintings can be real expensive. Hence, I left Handicapped Handicrafts with just a few magnets and a keychain for souvenir. 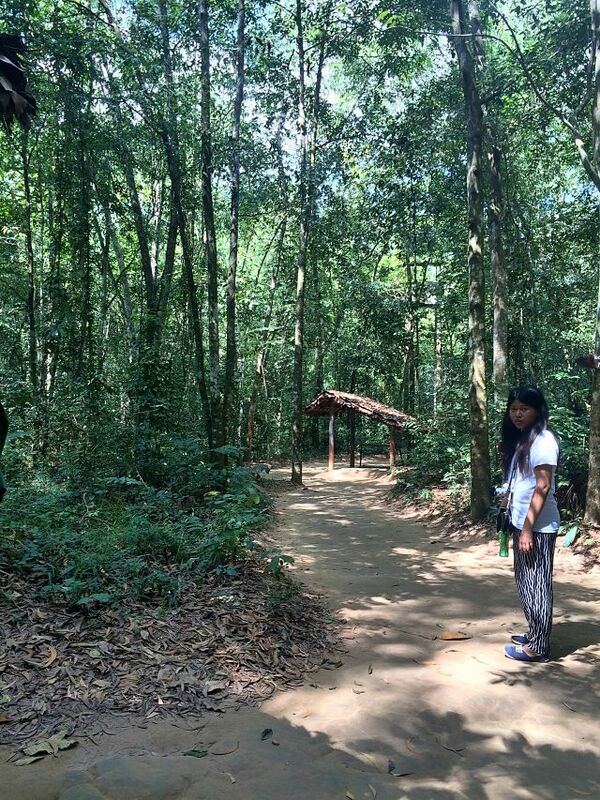 About 70 kilometers in the North-West of Ho Chi Minh City is the preserved relics of Cu Chi Tunnel. 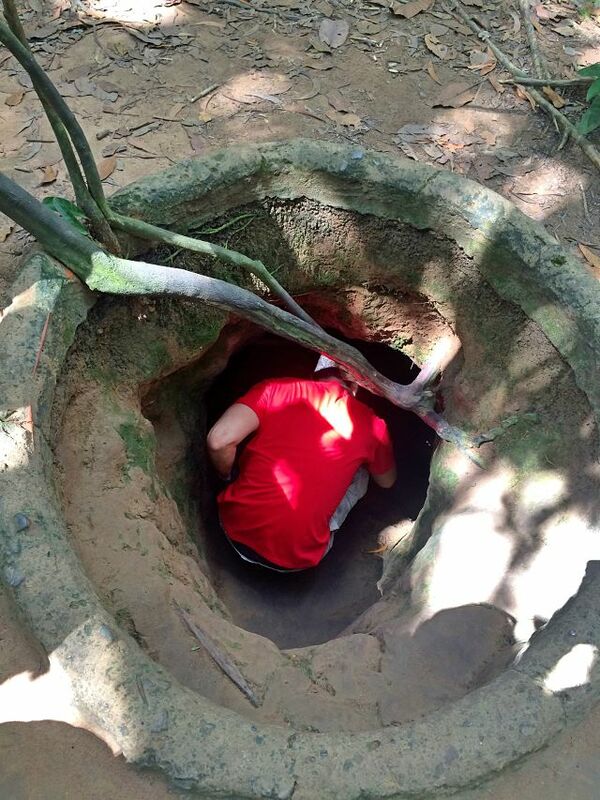 In 1968, Cu Chi tunnels serve as a military base of Viet Congs (North Vietnamese fighters) for the Tet Offensive. Before the tour, the only information I knew of the Cu Chi tunnels is that it was the hideout of the Viet Congs during combat. In this tour, I learned that it was also used as their communication and supply routes as well as living quarters. The tour inside the Cu Chi Tunnel complex starts with a video presentation that narrates the story of the Vietnam War. The voice over was in English but just like Andy, the Vietnamese accent was so thick I hardly understood a word. Hence, I napped. I’m not sure how I did it sitting down and not leaning on anything, but I succeeded into catching some zzs. To be fair, I was suffering from a lack of sleep so I was feeling lethargic. After my quick nap, I mean the video presentation, we proceeded with the tour. 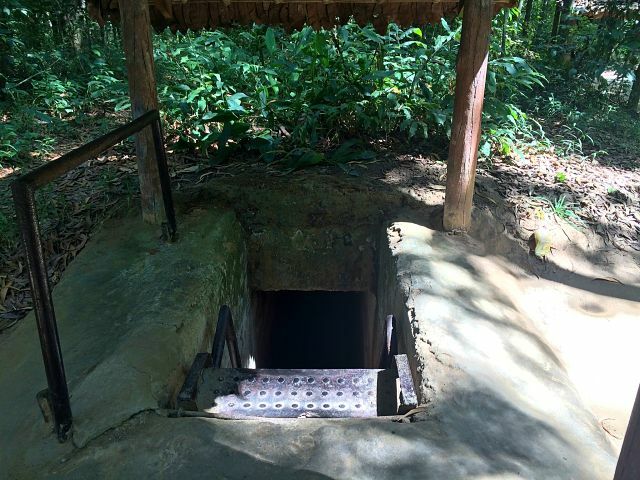 The Cu Chi Tunnel complex sits in a forest and there you can find the Cu Chi Liberated Area, Ben Duoc Temple of Martyr Memorial, Base of Sai Gon – Cho Lon – Gia Dinh Military Zone, Revolutionary Traditional Section of Sai Gon Cho – Lon – Gia Dinh, Base of Sai Gon – Gia Dinh Zone Party Committee, and National Defense Sports Shooting Ground. 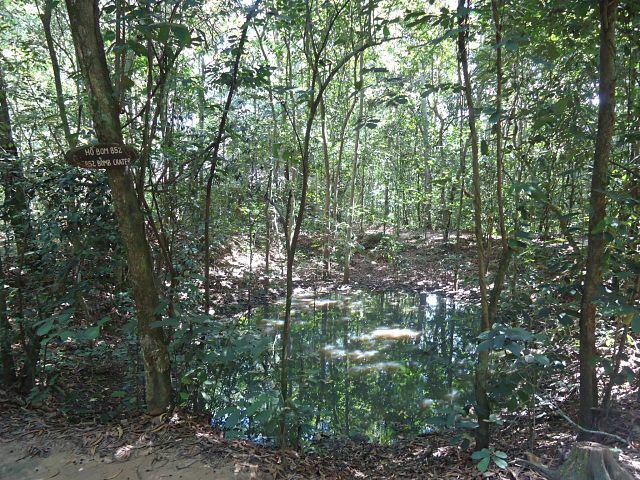 We passed by a small pond only it was not a small pond but a Ho Bom B52 bomb crater. 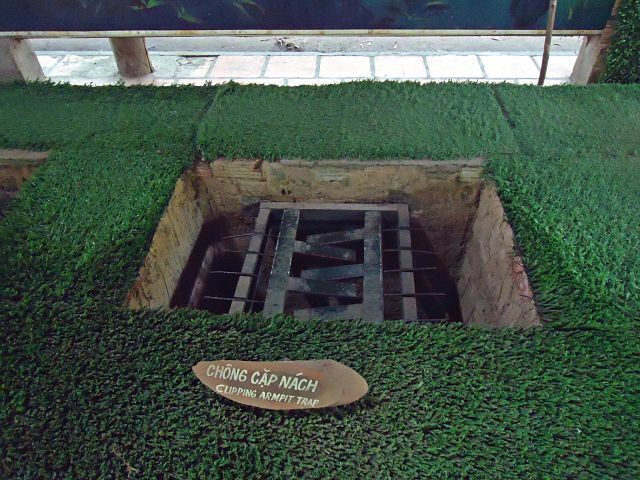 Along the way, there are also trap doors, which I immediately recognized as the one that most tourists like to try when visiting Cu Chi. Andy demonstrated how one could hide from this trap door, but first, he had to reveal it. He gestured toward the ground littered with dried leaves and covered in dust. Using his hands, he brushed a heap of leaves, uncovering a small rectangular wooden lid. It serves as the door of this very small space that could only fit one person. After Andy, only the men in our group went to experience going inside that tiny space in the ground. The complex also has replicas and actual relics of the booby traps that were buried in the ground. To my horror there is not just one type of trap, there are several of them, each one is lethal in its own right; there’s a clipping armpit trap, sticky trap, rolling trap, window trap, folding chair trap, swinging up trap, fish trap, and seesaw trap. I could not help but feel sorry for the soldiers who had the misfortune of stepping on any of these traps. I looked at these booby traps and had an unsettling feeling; there is no way anyone could fall there and get out alive. The tunnels are now well maintained for tourism purposes but back in the day, these tunnels are also home to poisonous centipedes, ants, snakes, and other dangerous animals. The Viet Congs stay hidden in these tunnels in the day, suffering from hunger, thirst, and heat and only come out at night either to engage in combat or to scavenge food and supplies. There are openings that are so small you wonder how anyone could go inside. 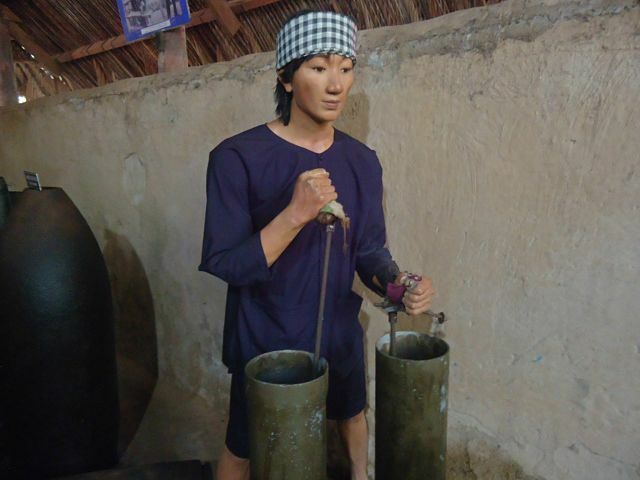 They also use dummies to represent the Viet Congs. The picture below shows how a typical fighter looks like. This one shows a procedure involves in making a bomb. Finally, we reached the part where we could enter a tunnel. See the roof behind the woman standing in the picture? That’s our exit point. Now here’s our point of entry. Here we go! The section that we took is about 20 meters long. There are a few lighting fixtures that illuminate the path. The ceiling is so low you could only navigate it by hunching your shoulders and bending your knees; sometimes we had to crawl. It was stuffy and hot, the path is so narrow we could only proceed in one column. Whenever somebody stops to take a picture, you’d hear some people from behind complaining about the holdup. The experience was so uncomfortable it made everyone impatient. Before long, my legs were already sore and my shirt was already soaked in sweat. Eventually, we saw the light, or rather the stairs at the end of the tunnel. The photo below shows where we exited. The journey albeit short was a bit tough so seeing through the end of it was rather exhilarating. 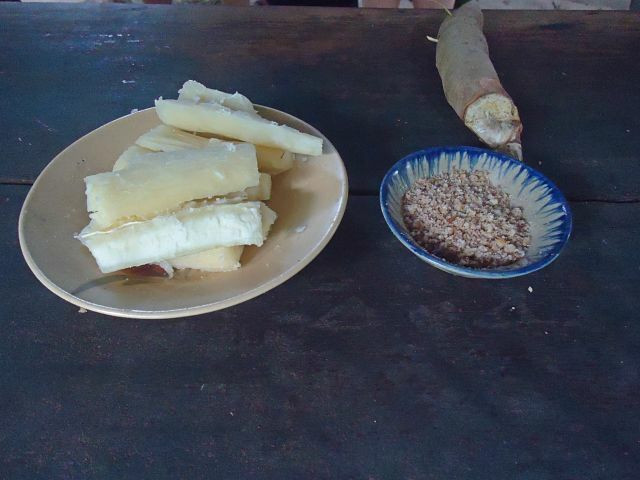 Afterward, we snacked on cassava with crushed peanut and brown sugar for a dip. 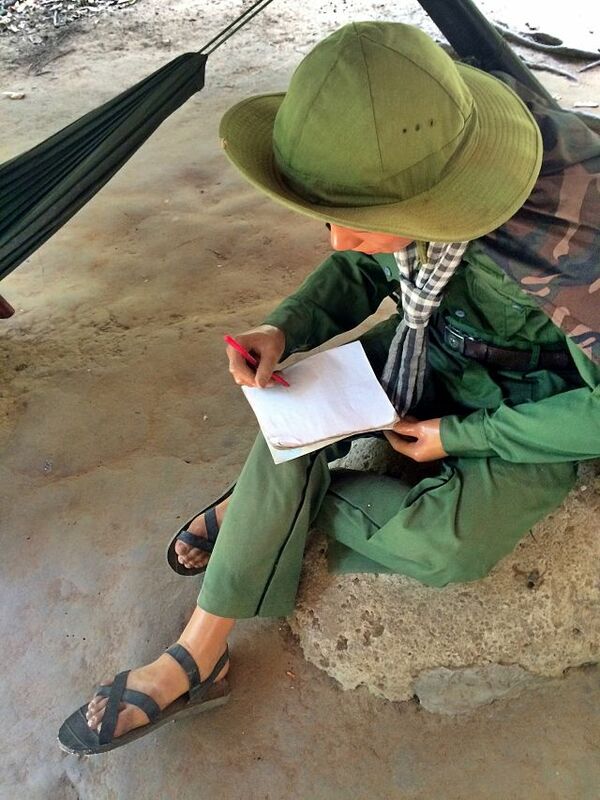 According to Andy, cassava is what the Viet Congs consumed most of the time during the war. We were given enough time to rest and for others, to shoot some rounds in the shooting range. Bing wanted to try the gun shooting, but I begged off because of the price. You pay by the bullet and it should be a maximum of 10. So let’s say you want to use the M16, that’s $1.40 (PHP66) per bullet so that’s already $14 or PHP660. For me that’s a lot. 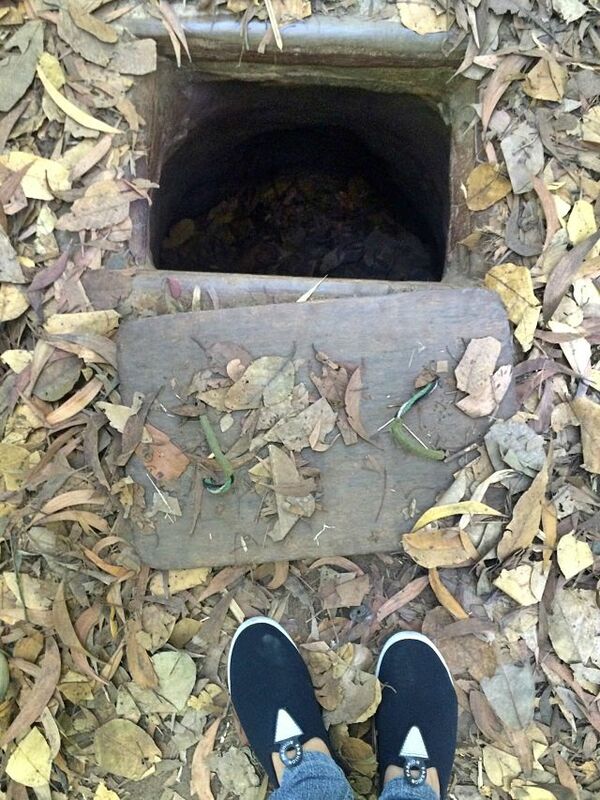 The Cu Chi Tunnel is a claustrophobic’s nightmare and I could only imagine the agony that the Viet Congs had to bear while hiding in these tunnels. I thought I knew everything there is to know about war from history class and books, movies, and museums, but after this tour I realized there is so much that I didn’t know. Going through the tunnel is another kind of education and I’m just glad that I took it. What about you? 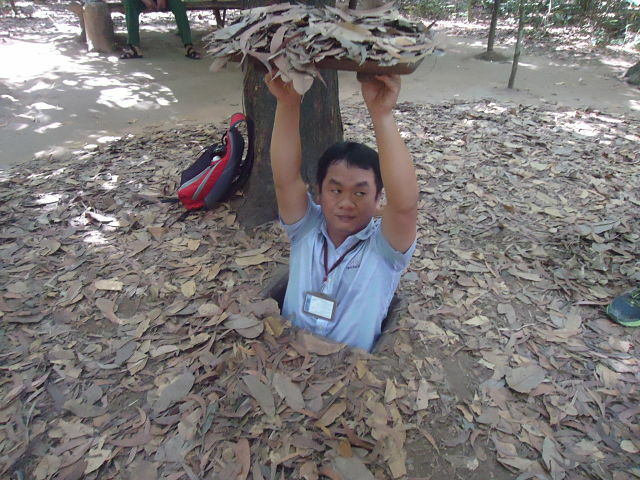 Have you been to the Cu Chi tunnel? Agent Orange- makes you wonder how a “civilized” country could do such evil thing! It must be heartbreaking to learn about it in the museum and then see the people victimized by it in the Handicrafts Factory. I was so sad I didn’t have time to see the tunnels when I was visiting the city a couple of years ago. I’m going to have to go back! Thanks for the post! I didn’t go to the tunnels when I was in Vietnam, I now kinda wish I would have… It would have creeped me out for sure but I think that would have been worth it! This sounds like a very informative tour but I’m not sure I have it in me to crawl through the tunnel! A big advantage for skinny tourists. 😀 A great alternative as well for ‘usual’ spelunking. Crawling sounds unique for tourists’ activities and it looks very fascinating. Need to be able to handle small spaces! we did not end up here while visiting this city, but sure looks like a kind of heavy experience to me! This is actually so amazing. I would love to visit Vietnam in general, that’s no secret, but I would love to visit these tunnels and crawl through like they did during the war! What an experience that would be. I’m a bit creeped out regarding small spaces, but I managed going into an Egyptian pyramind just fine, which was also a tight squeeze! Wow the size of that tunnel took my breath away just reading about it. I doubt I would fit in it! But the entire experience of the Happy Day Tour looks sounds really interesting! Wow, what an educational post. I don’t know much about the Vietnam war so this was an eye opener. I’m not claustrophobic per se but I think I would get really claustrophobic hanging out in the dark narrow tunnels all day. I need sunshine. Tough guys. The Handicapped Handicrafts looks like a worthwhile stop. I’m glad that the folks who work there have that outlet to both share their culture/craft while being employed. 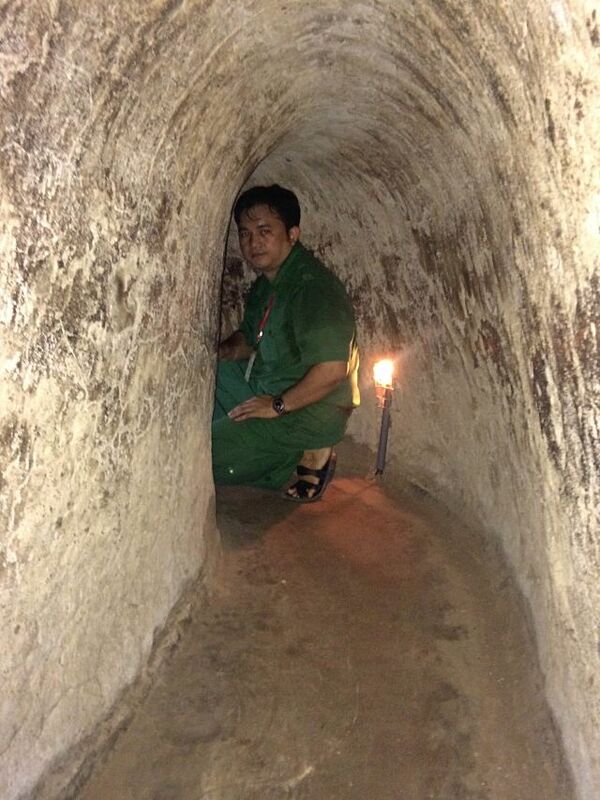 I’ve never heard about the Cu Chi tunnel before but it sounds super interesting. Hearing about history is never the same as seeing things with your own eyes. Seeing those traps and being inside must be really scary. I am not claustrophobic but I’ sure I would feel very uncomfortable in this tunnel. Nevertheless, I think it’s important to remind people how terrible war is and this is a good way of showing it. Haha looks exactly like the same experience I had when I went in 2010. Nothing has changed! I love history and I was really excited to be visiting the tunnels, but it was too much like a tourist trap for me. People selling me things, mistakes in facts (or maybe their stories are different to the ones I had read in American books) and it was very rushed. Not sure I’d go back there, but you have written a very good post about the experience. What an adventure. It’s an important historical experience that might help peace prevail. 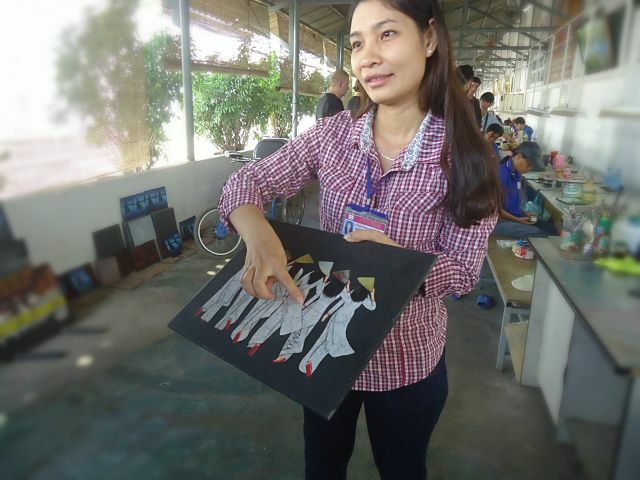 I was happy too with the Handicapped Handicraft workshop. We all need productive and creative work. All the better when it helps us make a living. What an interesting post, thank you for sharing! I read of the many horrors of the Vietnam war, the trpas and agent orange, but I can only imagine what it must be like to be in those tunnels. Or actually, maybe I cannot imagine it – I feel claustrophobic just reading about them! I’d love to visit vietnam and when I do, I definitely want to visit this – will have to take deep breaths, but will be worth it! Hey, Marge! Amazing post again! 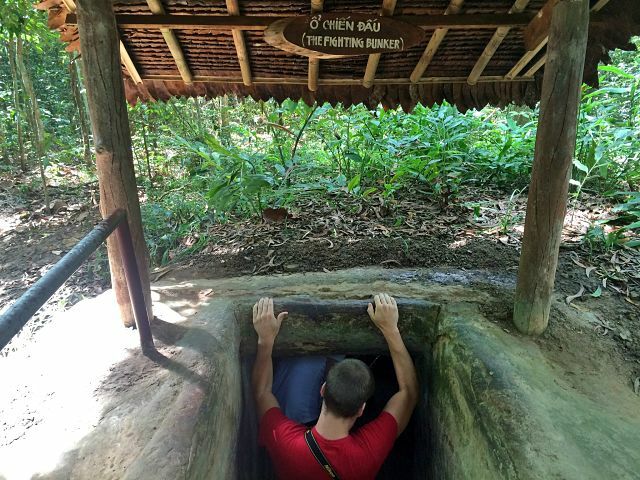 Two of my friends were in Vietnam in the beginning of December 2015 and they told me they could barely fit into these tunnels. I guess the Vietnamese during the war had been soo slim, eating only cassava and fighting that guerrilla war. Very interesting, but also sad story. They (my friends) also told me about how the Vietnamese had put bamboo straws so that they (the Vietnamese) can breathe inside during the attacks. Great story to share – thanks for that! Wow, what a strange experience. 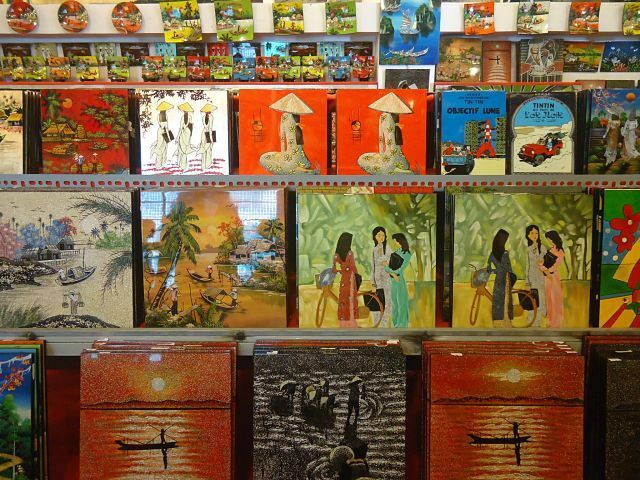 Great that they took you to the arts workshop as well though, their products look beautiful. Wow, that is one tiny tunnel! I imagine it would be difficult to climb through there. I climbed into an Egyptian pyramid once and though I’m not claustrophobic usually, it was almost too much for me. It was definitely not as easy as I thought. Great story! Omg only the photo of the tunnel makes me claustrophobic !! You were very brave to enter it.. The tunnels are amazing, they were sneaky little devils, not to mention ingenious and quite brave. Wow, this is such a crazy thing to see and quite scary too. It’s such a unique thing to see and great to go beyond the obvious. Wow, the tunnels are tiny! I have always wanted to see these, maybe it should be on my 2016 bucket list! I’ve never been to Vietnam, so also not visited the Ci Chi tunnels. But wow, so narrow these tunnels are. Must have been a great tour, and nice they have the handicapped handicrafts. They look nice, and it’s a great support to get some. What a fascinating tour! I wouldn’t survive a couple of minutes inside the tunnel. But a nice touch with those handicapped handicrafts! Great post about an impressive place to visit. 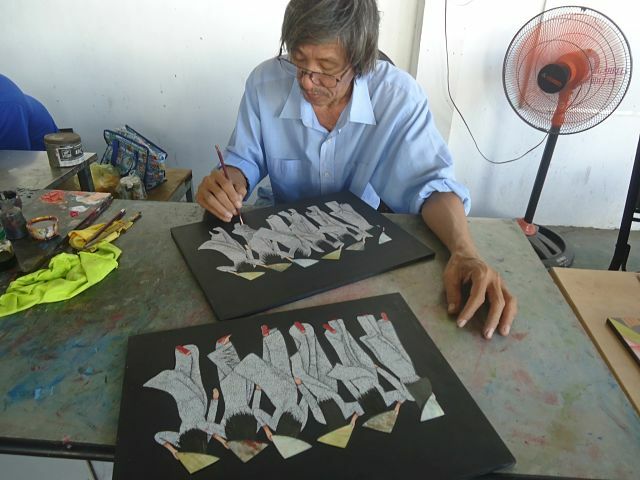 I have been to the handicapped handicrafts (the people working there make such amazing things) and the Cu Chi tunnels and it taught me a lot about the history of Vietnam. I learned it in school, but that definitely isn’t the same as seeing with your own eyes the effects the war had (and still has) upon people and the country. Louie also thought it’s hard to understand the Vietnamese English accent but I got it alright, so what happened was that our tour guide explained to us the history and I had to repeat what he had just said to him in Filipino. Haha. We also did not try shooting because I was afraid of the guns. 🙂 Maybe I was a soldier in the past life? It was a bit traumatic when I was hearing the gunshots firing in the background. You understood them Roch? Wow, maybe the next time I go to Vietnam I should go with you hahaha… You’re afraid of guns? Then that must have been really traumatic. Inside the tunnel I think 10 to 15 minutes. Sandali lang siya pero we stop along the way kasi alam mo na, picture picture. Ay ganun ba, mag gun shooting tayo minsan!